Is the message I’m about to read more important than my life? This is question all drivers should pose to themselves while driving. There are so many risk associated with texting and driving such as killing yourself, killing others, causing a car accident or just simply distracted by the conversation engaged in by the text message. The last text conversation I was having was about what time we were going to meet to work on a project. 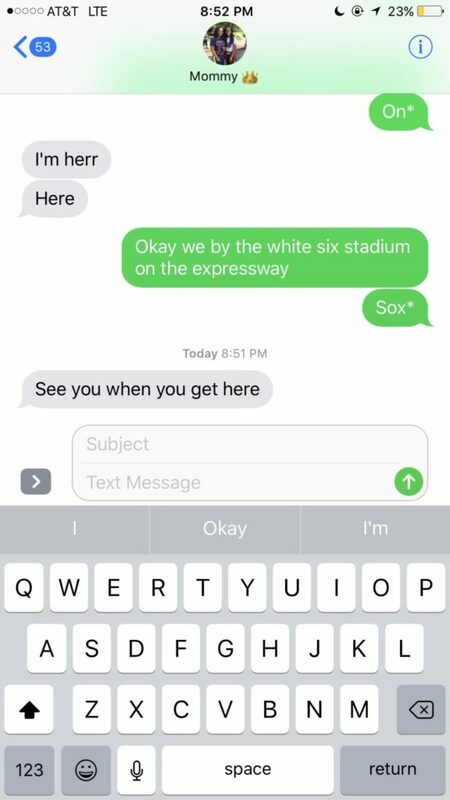 The text conversation went back and forth to figure out location, time, and how long before I made it there. The risk I took, while engaging in this text conversation, was focusing on where to meet at what time, that I never even thought about how distracted I was from driving. Car accidents happen in a split second even when you are concentrating on driving. I felt the urge to take that risk at that particular time, because it was my first big project in this class worth a fourth of grade, and I wanted to do well. I didn’t know even think twice about all of the consequences associated with my behavior. I was trying to respond to a text while waiting at a red light. While my head was down reading the text, a horn honked behind me, startling me to start driving forward. Had I not been able to use my quick reflexes, I would have bumped into the back of the car in front of me. Whew! Who needs an accident to drive my insurance up sky high? I don’t believe it is difficult for me to stop texting and driving, but more or less a conscious decision to practice this daily. I would like to think that I can stop texting and driving completely because I know the consequences and do not want to experience any of the negative consequences. I would like to change my habit by reading text messages before leaving home and once I arrive to the place where I am heading. I would also like to plan ahead meeting classmates the day before if possible. I would also like to not engage in conversations on the phone while driving to distract me (even when using my Bluetooth). At the end of the day I need to remember that nothing I am trying to read or text is more important than my life.